Located in the Central Business District, ibis budget Surabaya HR Muhammad is only 30 minutes from Juanda International Airport and surrounded by an international golf course. It is also near Pakuwon Supermall and Ciputra Water Park. The 148-room hotel has the new ibis bedding and offers great value accommodation at budget prices. Set right in the most prestigious area in Surabaya, HR Muhammad district is newest CBD Icon in Surabaya where business can meets with pleasure. Only a minutes from everyway, since we near highway. Explore great culinary experince around the hotel. We are only a minutes from the most famous food district, the G Walk, International golf course and the most prestigious mall Ciputra World is also near by to visit. Guest with kids can also explore the Ciputra Water Park that offers lots of fun. 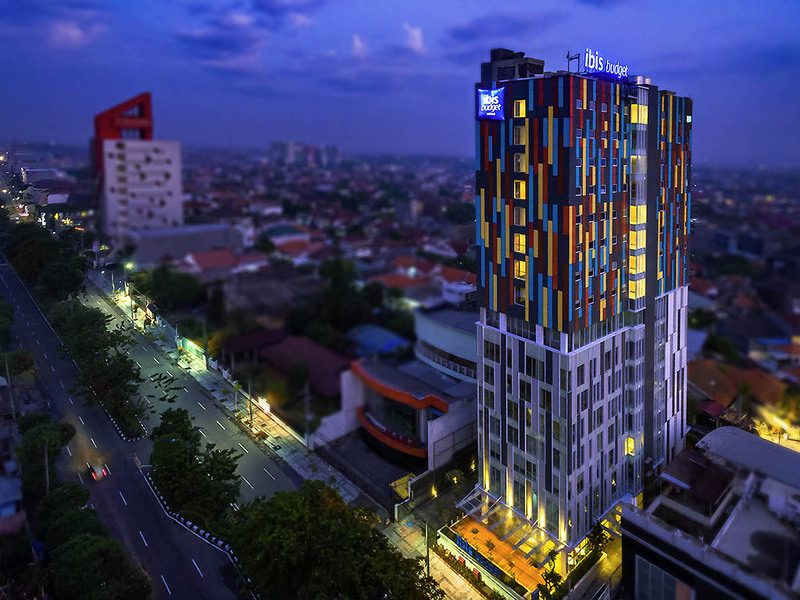 The ibis budget Surabaya Hr Muhammad hotel is strategically located in West Surabaya within Surabaya vibrant entertaiment and shopping precients which makes it popular among tourists. The 148 room hotel offers essential comfort at budget prices. Each room features the new ibis bedding, 32" flat-screen TV, shower and free WIFI. The restaurant offers buffet breakfast, which includes soup, bread, juices, fried rice, fried noodles, tea and coffee. again, worth the money. great location, and I like how the staffs don't change my towels every day (not sarcastic), you guys live up to the whole eco-friendly thing. and I appreciate it. The room was comfortable and the service was good. But nothing notable. Bright and clean rooms, with good natural lights and lightings. Attentive staff. Good food. Pleasant to all the senses. Nothing more that I can ask for for a Budget classed hotel. Very nice lobby with places to talk with guests. But room was noisy. Neighboring rooms opening and closing their doors day and night. Talking loudly. Walls are thin. Hallway noise echoes. All the noise disturbed my sleep and my time in the room. All was good. Although the aircon wasnt cold and the water pipe was broken on my first day. My room was 912. The staff also forgot to deliver back my suit from laundry until I asked it on my last day. Breakfast was great.. serving local food which I was looking for. good experience stay in this hotel. simple and comfortable. Environment are very quiet, could sleep soundly. Breakfast price is too pricy. A small room with comfortable but minimalist fittings makes for pleasing accommodation in a good location. Also, the cafe downstairs is good value for money dining. 1st, I stayed there only for transit, after going from work at Pasuruan then need to attend wedding on Shangrila Hotel and my original home at Sidoarjo, so I choose Ibis Budget for my temporary room for nap and bath.. My experience come to Ibis Buget HR Muhammad : the lobby is good, but after seeing the room, knowing the bathroom is just like that not like ibis budget diponegoro make me unsatisfy. The bed also good enough. Employee service also good, very friendly. For the price, still OK, maybe you can make another price list for people like me that only temporary transit. I never find the modern hotel budget. This is very good! Very comfy, near to the main road but quiet enough.